Last week’s post talked about the Tools and Literature of the Craft. This week I promised some basic suggestions for Candle Magick. So,let the flame be lit! Gift of answer to me. Candle Magick makes use of the properties and energies of a candle, color, etc. to direct the focus of energy towards a desired outcome. It is for this reason that candles are used in High Magick and Ritual workings. They become the physical representation of God or Goddess, the transformative power that lights all others or the symbol of the inner fires of Will. Within our coven we routinely pour coven candles for each member annually. The wax used comes from the remainders of the previous year’s candles and is melted down. All contribute an herb or oil to the mix and we pour energy and intent into the heated wax. A large candle is poured that will be used in ritual by all and then individual candles are poured for each member to take home. This becomes a way to connect energetically with covenmates if the individual is unable to be physically present for working or meeting. This past year we were unable to schedule a time for this, but we still had plenty of candle left to carry us through and maintain the connection. In spell work a candle not only provides a point of focus, but also acts as a container for the energies gathered and worked upon. Allowing the candle to burn down completely releases the spell into the flow of universal law. Lighting the candle for several nights can build the effect and acts something like a slow simmer. Holding the heat and intensity, but carefully and slowly releasing the essence allowing all the flavors and nuances to mature. Candle magick is simple, easy and can be quite effective in its purpose. The beauty is that it can also be rather transparent to others, as many use candles as décor in their homes. They are portable and relatively easy to make, if you are so inclined. If you choose to make your own candles, additional items can be integrated. I have crushed a small crystal and added its energy to the wax. Herbs and oils are readily available and can enhance the general properties and even the timing of pouring the candle can bolster the intent. Aligning the pouring with New , Full or Waning moon energy customizes the effectiveness for specific types of workings for which the candle will be used. Store bought candles can be similarly customized. Remove the wrapping and apply oil to the candle, anointing it with the properties of whatever oil you choose. Frankincense serves as durable purifier. And, Myrrh will stimulate the Higher Self and offer connection to spiritual realms. You can press finely crushed crystals into the base of the candle by heating the bottom slightly to soften the wax and then pressing in down into the crystalline substance, much like coating fish with breadcrumbs. Leaving the candle out under moonlight of any particular phase can attune it to those particular energies. And, placing the candle in a window or outside (depending on the heat temperature) under the sun’s watchful eye can enliven the candle for use in solar, energy or fire workings. Scribing sigils, runes or other sacred markings on the candle and envisioning these symbols moving into the center of the candle can be used to sustain long-term workings. Each time the candle is relit envision the energy of the symbol emanating, much like an aura from within the candle. Additionally, using a specifically colored candle enhances the effectiveness of the spell. Some basic colors are listed below. If you cannot find a specifically colored candle, a makeshift way is to use a small round mirror (can find these at craft stores, and should be approx. 2-inches larger than the base diameter of the candle) and colored paper. Cut a circle just slightly larger than the candle base out of the colored paper that you have selected for the working. Place this on top of the mirror. Place a white candle on top of this. The reflective energies of the mirror will draw up the color rom the paper into the candle’s field of energy. And, when eh candle is lit the flame will enhance the glow reflecting back into the mirror creating a beautiful energetic circuit. White – Light and the reflection of all colors. Red – Will, action and vitality. Pink – Used for love of the heart. Orange – Used for attraction, communication, energy. Yellow – Well-being, concentration, intuition, health, strength. Green – Represents health and healing, money, changes and renewal, fertility. Blue – Spiritual, healing, memory, calming and centering. Indigo – Brow, third eye, psychic center. Psychic awareness. 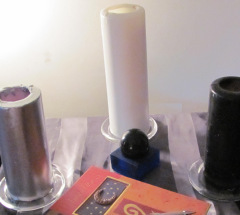 These are just a few very simple and basic ideas to get you started in how to use candles for magick. Be creative. See the candle as not only an object of Fire’s expression, but also containing the properties of Water (fluid wax when heated), Air (the aroma and oxygen accessed in keeping the candle light) and Earth, in its solid form. The element of Spirit is your intent infused and connected to the malleable form of wax, color, scent and more. And, the magick is in the ability to create Light in a small pocket of space that was not so brightly illumined just prior. What is Mercy and Majesty? My favorite movie when I was younger was the 1950’s classic- Bell, Book and Candle with Kim Novak and James Stewart. It was the story of a witch who loses her powers because she falls in love with a mortal. The happy ending is that she ends up with the object of her love and they live happily ever after. I was intrigued by the movie and the workings of witchcraft and have often thought back to this first exposure to the concept of the tools and books of spell work. These next two posts will explore the uses of the tools of the Craft (the Bell), the necessary Books that support the work and finally a brief over view of Candle Magick (next week). There are many and varied tools that are used in the Wiccan practice of magick. These, in and of themselves are not inherently the “source” of magickal power, but work as conduits and points of focus for the magickal practitioner. You may often hear it said that there is really no need for any tools other than yourself in working magick; and this statement would be both true and false. The energy and focus and intent are specifically your products, so if you did not have your tools with you and needed to perform a magickal working, improvisation on finding suitable “stand-ins” or using nothing but your own devices would be necessary. On the other hand, we are symbol driven beings. The kinesthetic, tactile and engaging of the senses in connecting to and working with a specific tool are vital components to pulling the wholeness of the working or intent together. The tools serve to stimulate and place your consciousness in alignment with what the intent and focus of the working is. Your personal energy which becomes a vested part of the tools you calm as your own, works in resonance with the energetic state in which you are when the ritual or working is begun. You could think of it in terms of the tools holding your energetic imprint and memory of all the workings you have done previously. Because your tools become so much a part of your magickal being, it is not unusual to see a witch bring their athame into the ritual space and are worn on the person of the witch; even if coven or another’s tools are present that will be actively used. The athame is carried in a sheath that can be attached to the cords worn and should be at the ready should someone need to be “cut in or out” (using the athame to scribe (or cut) a doorway in the energetic fabric of the cast circle) of the circle during ritual. The wand may be placed twined within the cords worn over the ritual robes and readied to direct and focus a stream of energy towards a specific point during the ritual or working; if called upon. It is for these reasons that often an amulet in the shape of a pentacle is worn by the witch. In some group rituals, everyone is asked to bring their own chalice to be used by themselves in the ritual celebration or working. Having your own specific tools and then using them regularly strengthens their intent. I’m sure many of us remember standing on the sidelines as a parade went by and the feeling of resonance within our bodies when the band would pass with the thumping beat of the big bass drums. We responded from the core and felt completely shaken from the vibrations of this massive instrument. Sound is all around us; albeit transparent to most as we go about our busy days. But certain levels of sound and certain vibratory frequencies within that resonance can transport us from a harried pace to a clam peaceful setting. From a place of inertia to involuntarily making us move and finally transporting us to a place of altered consciousness and ecstatic experience. 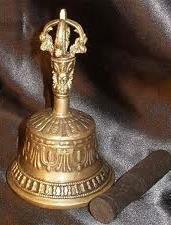 The ringing of a clear bell just prior to ritual, cuts through the energy and with intent serves to clear the space to be used of negative energy. It also gets our attention; and signals that something is about to happen. The same toning of a crystal singing bowl can, in addition to clearing space also help to raise the level of response and vibration within our own energetic fields. 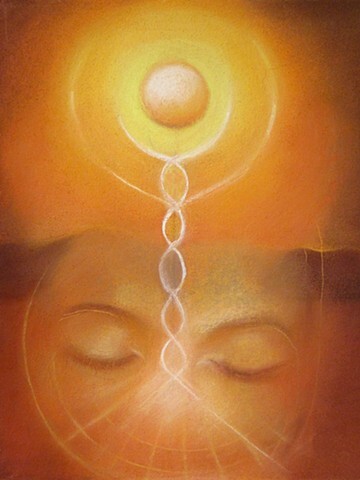 We feel the energy rising within and consciousness moves in accord with that elevation. Sound creates different energetic patterns and states of consciousness. Incorporating sound into ritual and workings adds another layer of awareness and potential for opening and manifesting. I often use a singing bowl prior to workshops and at times within ritual. The gentle crescendo of sound and the resonance of higher pitch lend themselves nicely in actively rising on the planes in an auditory sensorial experience. Books are the staple of magickal practice, teaching and learning. 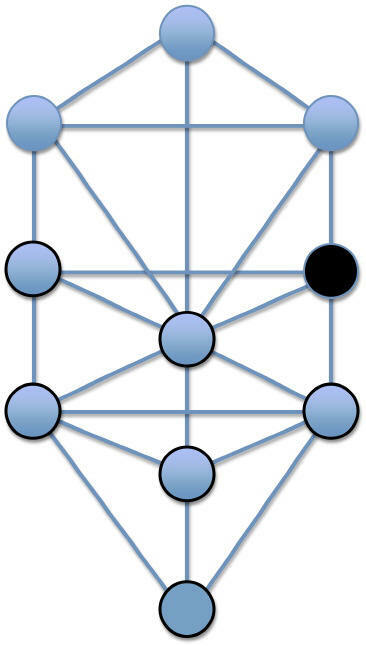 Access to what in past years had been only shared among initiates and those who had committed to coven, lodge or grove is not only prevalent in all venues but at times difficult to sort through selecting what is bonafide and usable information. Technology has made reading in any venue as simple as turning on a phone, tablet or computer. Still, there is nothing like the tactile sensation of holding a book, read it slowly and digesting each new thought allowing it to nourish and feed the hunger to learn. Books from reputable and respected authors within the community serve to enrich and enhance our learning process and inspire us to debate, question and formulate our own conclusions. As we continue to gather more information and fill our personal libraries there comes a point when you will want to begin a Book of Shadow and Light. This is essentially a journal or guide that holds special Quarter Calls, rituals, information and results of herbs used , incense recipes, spell work, etc. It is your own personal record of your magickal workings and progress and represents you actively engaging in the creative process. It is called a Book of Shadow and Light to correspond to the polarity of all magickal workings; that which is overt and that which is hidden from plain sight. This journal should be dedicated to holding your magickal process and not used for mundane or other purposes. A Book of Shadows may also contain journal entries that relate to the work done and the after effects. I prefer to keep these entries in a separate journal, since I often will go back and review them and it is more portable to carry a smaller journal. 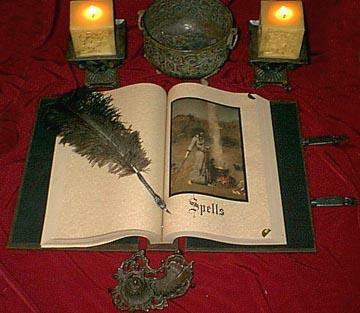 You will also want to bring your Book of Shadows intro sacred space with you; especially if there is a specific call, invocation or order of ritual that you wish to repeat precisely as done previously. Generally, your BOS is not something to share with others, hence the mystery that often surrounds such a record. It is your own personal journey and committing that journey to writing gives power and intent to the works that you do. It is also a history of your beginning steps on the Path of the Wise and can be used as a treasured and valuable resource as the years progress, your skills and knowledge increase and truly living a magickal life has become a 24/7 experience. There are no set and fast rules about what form or how your BOS should look. Some prefer an actual journal type book; others prefer to use electronic files and keep everything on the computer. One is not more effective or better than the other. The important thing is to make it your own. Personalize it in your own unique style. If it is an actual book handle it frequently. You are then also imprinting your energy into it in a physical, manifest way. If it is electronic, BACK UP your files regularly. Open them regularly and as you are typing establish a flow of energy that moves with intent from your hands and fingers into the keys as you type. Remember, as with all magickal working and practice, INTENT is the basis of movement forward on your desired path. With that thought in mind, your BOS can be as simple as a spiral bound notebook or as elaborate as a finely decorated handcrafted journal. If you have a space available that you routinely use for your personal rituals or daily meditation, this is an excellent space to also dedicate for the writing in your BOS. Information is freshest just after completing a ritual. So, if you are working a personal ritual, remain for whatever time is needed to record your experiences and make note of what worked what didn’t etc. You can even incorporate this into part of the working so this act becomes part of the ritual itself. If attending a public ritual, there is usually time and space after to jot down a few notes before leaving. I have often sat in my car after a potent ritual and committed everything to my BOS before I started my journey home. And, then I always completed more the next day as other insights revealed themselves. Be sure to record your experiences in meditation and divination practice as well. These entries form the foundation of a timeline of your progress. Looking back and marveling at how far you have come in your spiritual progress encourages you to be confident in how you process energy, ritual experience and meditative guidance. There is a saying that I firmly believe that states that all (positive spiritual) paths ultimately lead to the One (source of all). My belief in this has come as the conclusion of countless numbers of years exploring many different belief systems. From these explorations, threads of commonality, albeit, different semantics, have woven a spiritual tapestry that is as rich and diverse as the many roads Ive taken. I had benefit of being raised in n open and supportive spiritual environment. My Grandmother and Mother had briefly taken the fundamentalist Christian path and came to settle on a new thought metaphysical religion. There was no dogma and the core belief was in the inherent divinity within each individual. 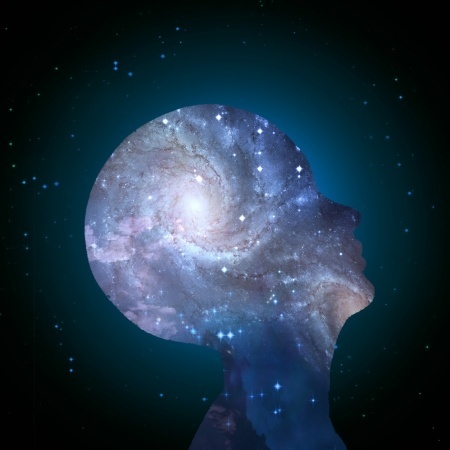 The aspiration towards the Christ Consciousness (exemplified by Jesus; but not exclusive to this individual) was goal of spiritual work done through positive affirmation and conscious awareness of the effect of mind on matter. I taught Sunday School and gave some Sunday lessons while still in my early teens and tried to live the spiritual life 24/7; another concept of practice that emphasized the spiritual path as one that extends well beyond Sunday Service and religious holiday. All the while I was active in this church, encouragement was given to explore freely what other spiritual paths had to offer. Rosicrucian and Astara, Witchcraft and Buddhist Philosophy, Yoga and Eastern Energetic Protocols all blended seamlessly in a young mind that was eager to learn and grow. I also firmly believe that choosing a specific spiritual path is a very personal choice and as such should be made by every individual of their own accord and in their own time. When we had children, it was my mission to allow them to experience a broad spectrum of spiritual and cultural practice. We celebrated holidays of Hindu, Jewish, Catholic/Christian and more. 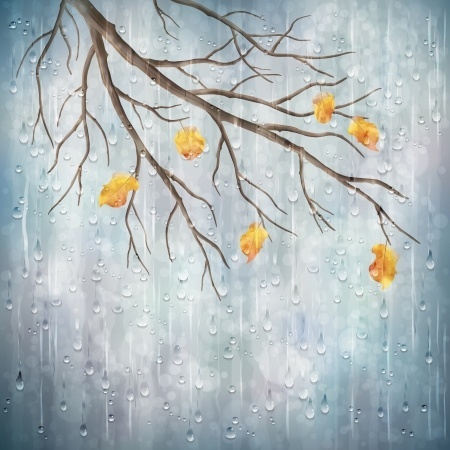 My own practice of Wicca flowed through many of the seasons and the children were free to attend what they wished of coven and Tradition events. As they have become young adults, their spiritual path is their own to claim, but the foundations were laid for more informed choice. When we reach out to obtain more information about the varied beliefs, we are better informed about what our own belief system looks like. When we take the time to participate in some of the rites and ceremonies of worship, we can feel at a deeper level what resonates for our own practice. And, if after having decided on our own course we maintain the effort at bridging the divide that often occurs when we only see from the narrow lens of our perspective, and remain open to what each spiritual path has to offer the other, we become the bridge under whose strength the many streams to the One may flow. This week do a little research into a spiritual path other than your own. What are the commonalities and what are the differences? Are there aspects that would enrich your current practice? 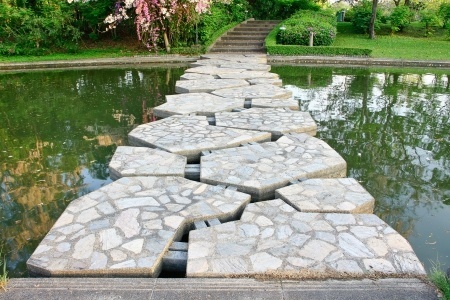 When we expand our perspectives in this way we create new stepping stones that elevate and inspire us to seek more from the current stream of practice we flow upon. The pieces of each new offerings puzzle find there point of connection and the gifts of a new shoreline to explore are within reach. Week 30: A Weekly Reflection. R.Fennelly.February 2013.Serpent’s Gate. Waves on emotions’ murky seas. The arts have run through my veins like life giving blood from the earliest time I can remember. My grandmother danced me to sleep as a baby and I was surrounded by music, art, dance, writing and a mother and grandmother who knew the value of their mystical worth. That spiritually artistic environment helped me to create my own way of moving through the physical world, and although I did not completely realize the intrinsic connection to a path of magick, I saw beauty, energy and form in the places that most do not realize it. I believe the fabric of the human soul and consciousness is fed by the stream of artistic endeavors and creative actions that surround and permeate our every moment, whether consciously or at the subtle levels of our responses. In retrospect, this belief and the foundation from which it was created has been the singular thread that has punctuated all of my life’s experiences both magickally and mundane. I am a visual kinesthetic learner; meaning that I learn best when visually engaged and am able to act out or move in accord with what is being taught. Most magickal workers are visual kinesthetic in their basic learning style. This mode of learning and processing is also the underpinning of most artistic experience. The Arts stimulate the senses and open and awaken the neural pathways to respond in a more dynamic way. This stimulation in turn causes a tactile response; integrating and responding to the experience through the process of doing. Add the visual component and you have the key ingredients of magickal practice. 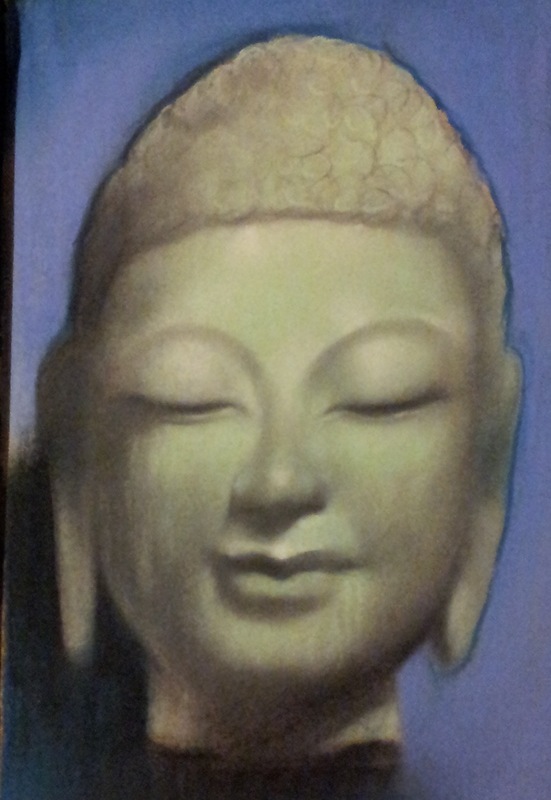 Learning through doing and visualizing intent-fully what is sought to be brought into manifestation. We hone these skills through access, albeit at times unconsciously to the themes of artistic expression that surrounds us daily. The term “Circle of Art” gives some indication of the potency of artistic expression that is called upon when crafting the work of magick. It is within this circle of continuum that we use sound, movement, dramatic intent and create the painting of vision of what we desire. It is scientific fact that the brain responds in accord with the and signature of rhythm that is provided it. If we look at this response using the definition of art it is clear why so many of these forms of creative beauty are used to access the deeper response of the soul and elevate conscious awareness to a place of inspiration. Music is used as therapy to heal, calm and stimulate function because of this innate resonance of the neural pathways to specific electrical patterns. Visual Art evokes emotion through use of color, tone and hue; again creating specific patterns of vibratory resonance and the geometric or non-linear method of structure produces its own set of stimuli for the brain to respond or react to. Movement or Dance catches us in the wave of energy produced by the fluctuation, ebb and flow of carving out shapes within the fabric of space and the auditory response to the music accompanying this pattern of vibration creates a new set of rhythmic response. Theater and Drama allow us to step into the roles of fantasy and myth, try on different personas or live through the experiences being portrayed giving us respite from the routine experience. My first magickal experience occurred as a dancer performing at the age of 10 or so. I did not at the time realize I was setting up the gateway and intent for magick to move through me. My only intent was to connect so fully and deeply that I would become the persona of the role I was portraying and lose my human nature in the process. The desire was to transcend human form and become something more. The intent was powerful enough and the music and rhythm acted as the keys that opened the gates to the other realms through movement and motion. I became the swan flying high above the earth. I was the beautiful being that was shot through the heart and gracefully fell to earth, wounded and in the throes of death. A final arch and curve o beautiful elongated neck, breath of white feathery wing and the final lifting upwards towards eternal ascending flight as death welcomed me into its soft sleep. The music stopped and I once again returned to the land of human and living; applause awaking me from this deep connection forged as the gates of magickal working closed until called forth again. One of my first workshops was entitled: Ritual Drama. We began with discussion of how adding a dramatic (or theatrical) approach to the myths, celebrations and stories of the Sabbats. These stories enacted were not only the vehicles for enlivening our own inner creative nature but served to draw out these same qualities within those who were witnessing these plays. We enacted the celebration of Yule and the battle of the Holly and Oak kings. Emphasis was on projecting the voice and calling up the energy of the role and story you were portraying from the center of the solar plexus and the throat chakra centers. We had no costumes, just imagination and the desire to embody what was to be portrayed. Each word, each gesture had its own meaning of significance and each imparted its own wisdom etched into the consciousness. Music soothes the soul, quiets the mind and sets the listener in a space of tranquility and peace. Music unleashes the prime instinctual nature and rouses the passions, spirit and emotions of the listener to a place of alertness and action. Music inspires what will become art or a piece f great writing. Music links the atoms and cells of its vehicle in grace and fluid motion, or syncopated frenzy. Music beats out the rhythm of the heart and carries the journeyer to realms hidden and remote holding treasures of deeper mystery. Music carves its way through the energetic fields surrounding and like the ephemeral flutter of butterfly wings, lightly etches its feathery strokes; forever changing all in its path. One of my daughters is an artist. Her work is inspired y the spiritual nature of humanity. She is often lost in the work she produces as slender hand sketches, paints and adds life to what she creates. The visual image is a powerful tool in magickal work. We use statues, magickal tools, candles, amulets, altars and more to bring our intent into a place of manifestation. We empower sigils and glyphs to hold the energy they have been created to embody and we garb ourselves in the dress and style of the magick we work as form of identification. Underlying all of these actions is the universal principle of attraction and the resonation of like with like to produce a synthesized and cohesive newly created product. When you read her artist’ statement below, you have a sense of what is the intent for the work to be viewed. The interesting thing about this is that this statement will vary as the artist finds new routes and methods of expression each having been formulated from the foundation of the other. My work is centered on the relationship between the human body and his/her psychological environment. The paintings store an energy and imprint of the moments in which it was made, a physical manifestation of the urge to create. The images serve as a mirror for the psyche of the viewer. Art as a viewing and making process can raise awareness and restore the unconscious struggle for internal/external union. In understanding our inner components that give way to the whole of ourselves, the better we can empathize, accept, and co-exist with our fellow man… Caitlin Fennelly, M.F.A. Art can convey the line and flow of the alchemical elements. Color and the vibration emitted from each create imprints upon minds and are translated into our emotional stores to be accessed on mundane and spiritual work. We are surrounded by color in varied hue and tone and the simple act of walking into a room painted in one color versus another can stir the memories of associated emotions stored as response to that particular color’s vibration. 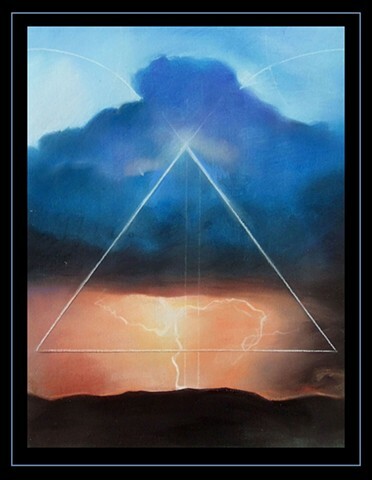 The painting below is one I used for the cover of my book, The Elemental Year. I had asked my daughter to paint something evocative of the four elements that would conjure the necessary connections at a subtle level. This is the power of the visual arts and their subtle yet profound impact on the way in which you in turn visualize the world around you. This is the magick of creation pouring from one vessel into the next and available to quench the thirst of all who desire its sweet nectar. The tactile sensation of typing or putting pen to paper transfers the energy of the writer to whatever is receiving his/her imprint. We are often told to read between the lines and in magickal terms this is more accurate than may seem. There is contained within each letter put upon the page, a holographic image of its creator Within that writer are the points of cellular light that have flowed through every individual and all matter from the beginning of time and creation. We are accessing the core essence of what was the intent at the first inception of its creation. We not only connect to the writer but we connect to the pure essence of the origin of concept. These are some of the great mysteries spoken of. Not simply the material we see, but what is “hidden in plain sight”. The Arts reach into the depths of our being and extract the essence of our true beauty and creative potential. And, once acknowledged forever change how we perceive our world and our place within it. This is the beginning of a series of articles about each of the Arts and their application and effects on Magick and spiritual practice.